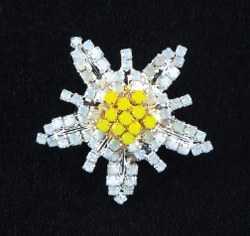 This gorgeous Edelweiss flower brooch is custom-made exclusively for Esther’s! 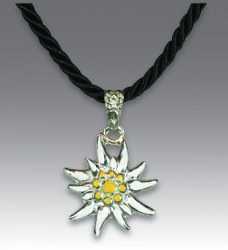 The Heidi Pendant is 1" diameter with 7 topaz colored Swarwoski crystals. 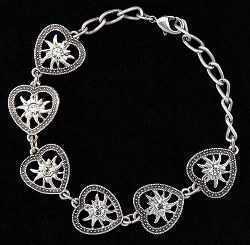 The chain has 3 links for use at 16, 17, or 18" length. 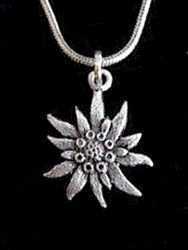 Necklace with Sterling silver "Edelweiss" pendant that resembles Alpine flower. 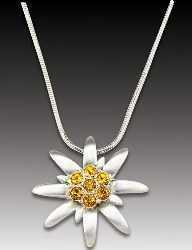 Silver-plated Edelweiss flower is 3/4” dia. 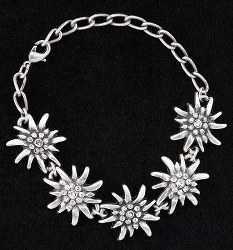 Sold as a set with 17” long neck chain. Imported from Switzerland. 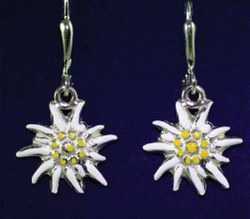 The Simone Earrings are a 1/2" diameter cutout flower with 3 clear Swarwoski crystals. 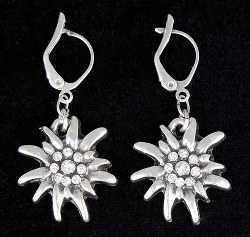 Post design earrings. 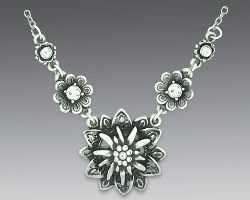 Edelweiss Accents Jewelry for Any Occasion Edelweiss accents are elegant enough for formal attire, yet simple enough as casual accent for work, or an evening with friends. 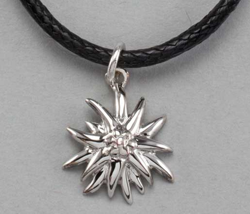 Edelweiss necklace has an Edelweiss with 9 cut stones on a floral-design pendant, 4 smaller floral pendants have a cut stone in the center. 20" long chain.